Nowadays, Green Analytical Chemistry (GAC) idea is of high importance, with impact on the rapid growth in the sample preparation area with special emphasis on sample preparation simplification, miniaturization and automation. Due to the fact that GAC is of high importance today, this study is focused on the evaluation of green sample preparation techniques for organic compounds. It is well known that sample preparation is considered a crucial part of analytical procedures, particularly in samples characterized by complex matrices composition. 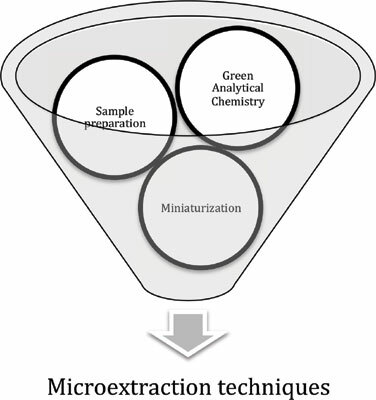 The parameter of “greenness” is as important as selectivity in order to avoid using harmful organic solvents in sustainable extraction techniques. These solvents can generate hazardous, toxic waste while consuming large resources volume, thus, developing new, eco-friendly and benign solvents which would meet technological and economic demands is perhaps the most popular aspects of Green Chemistry. Some examples of these “green” solvents are given in this work. In addition, several new miniaturized extraction techniques are described. Here you can highlight Solid Phase Microextraction (SPME) and Liquid Phase Microextraction (LPME). However, the best option would be to use direct methods of analysis, where sample preparation is not required. The given study also shows the possibilities and limitations of using Eco-Scale and GAPI tools for the assessment of the green character of selected analytical procedures. Both tools were applied to assess 9 different analytical procedures and both showed similar results presented in a different manner. Green analytical chemistry, SPME, LPME, GAPI, eco-scale, green solvents.